It’s not easy being a king. On Friday, Norway’s 78-year-old monarch spoke loudly and clearly as he customarily read aloud the government’s annual proclamation from the throne, but then he skipped over an entire chunk of text. 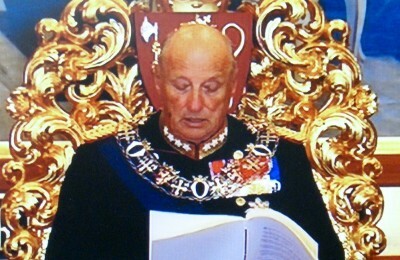 It was news bureau NTB that first noticed the royal blunder, as King Harald V read what’s known as the trontale, the king’s speech from the throne, at the annual and highly ceremonial opening of Parliament. The speech is meant to set the government’s goals for the year ahead. Prime Minister Erna Solberg had handed the speech to King Harald before stepping back and standing with her government ministers during the monarch’s entire recitation. Standing, and not sitting, is also an important part of the rituals on the opening day of Parliament. The speech itself outlined how Solberg and her conservative coalition intend to tackle the challenges that lie ahead, and the speech started right off with the refugee crisis that has dominated headlines for months. The government promised to take in refugees arriving, admitted to the challenges their arrivals in record numbers represent, and asked the Parliament for speedy approval of extra funding to handle the situation. The speech also highlighted Norway’s financial aid to refugees still in Syria and neighbouring countries, and noted that even though Norway is not a member of the EU, it will take part in several initiatives the EU is now taking to also aid refugees. King Harald then neglected to read aloud that “throughout history, many have stepped forward for we Norwegians when we needed a helping hand. Now we are the ones who must step forward for people in need.” The missed line ironically would have had personal meaning for King Harald himself, who was a refugee as a young boy during World War II. The royal family fled Nazi Germany’s occupation of Norway in 1940 and went into exile in both Great Britain and the US. King Harald spent five of his childhood years in Virginia. Norway’s monarch got through the rest of the speech, which went on to address the need for jobs, diversification of the national economy and ongoing social welfare programs. Then the youngest member of Solberg’s government, Education Minister Torbjørn Røe Isaksen, read the government’s much longer state of the union address, which mostly hails its own accomplishments during the past year. Isaksen also delivered the entire address in nynorsk, the other official Norwegian language based largely on dialects. The entire opening ceremony lasted less than an hour and was ceremonious indeed. Flags lined the streets as King Harald, Queen Sonja and Crown Prince Haakon drove from the Royal Palace to the Parliament Building (Stortinget), just a few blocks away. There they were met by the parliament’s political leadership, which escorted them into the main chamber, just after all the heads of state directorates, the police, central bank and other top civil servants had made their entrance. Inside waited all Members of Parliament in formal dress, many wearing traditional national costumes called the bunad. They sang “God Save the King” before King Harald began speaking, and ended with the president of the parliament’s own speech and another a capella rendition of the national anthem. Then the royals departed, followed by the government with all ministers bowing or curtsying to the parliament’s president, Olemic Thommessen, and exiting through a corridor lined on both sides by all the top civil servants. MPs aren’t allowed to leave their seats or start political conversations until the royals have left the building. Thommessen, dressed once again in his own ceremonial bunad, told Norwegian Broadcasting (NRK) that there were no “practical consequences” from the king’s failure to read the government’s entire proclamation. “Everyone who needs to work with the speech will use the printed version,” Thommessen told NRK. The royal blunder, he added, won’t have any effect on the debate over the speech that’s set for Monday and Tuesday of next week, when opposition politicians are expected to pick it apart.